There's a buzz book for the summer - you might have heard of it already -- The Shining Girls by Lauren Beukes. Featuring a time traveling serial killer, it has huge potential for a beach read thriller, but I don't know. Despite enjoying the main character, I felt it was missing something and my overall reaction after reading it was lukewarm. This book on the other hand is much more to my liking. Probably closer to three and a half stars, it's an easy four in my books because it features all the elements I adore -- suburban New England setting, family secrets and lies, prepubescent girls doing naughty things with tragic consequence. It's an "all grown up and looking back" story as the adult tries to untangle the mysterious events of a dark childhood summer. It's a dual narrative that flips back and forth in time -- from the summer of 1979 to the summer of 2003. There's mood and atmosphere and dread and intrigue. It's a voyeuristic look into the oft-twisted and inappropriate shenanigans of life in the 'burbs. Sadie is a pushy, bratty kid, with razor sharp smarts and a vivid imagination that's only going to get her into trouble. Her mother is a domineering, manic depressive drunk who isn't going to be there for Sadie when she needs her the most. Out of boredom and as an act of rebellion, Sadie hatches an elaborate ruse to amuse herself and her best friend. It's the summer of 1979 and her victim is the neighborhood outcast, a young girl with a miserable home life. The consequences of this cruel prank will have a tragic ripple effect. Sadie grows up. The memory of that time is locked away in a deep, dark corner of her mind. She has a husband and two beautiful children. But sorrow has found Sadie. She is grieving her miscarriage and in this vulnerable state, back walks the boy she crushed on as a young girl. He's all grown up and stirring up more than the overwhelming sexual attraction she feels for him. Sadie begins to think about that summer long ago, seeking truth to all the unanswered questions she's lived with her entire life. 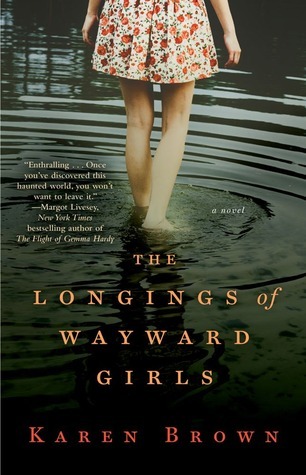 For a debut novel, The Longings of Wayward Girls (great title) shows a lot of promise. In the best ways, I was reminded of Megan Abbott's The End of Everything, and Gillian Flynn's Sharp Objects. Author Karen Brown is on my radar and I will definitely be seeking out more of her writing.